Today’s local dailies feature very special Op-Ed ValPaks – columnist + editorial cartoonist – focused on the Last Temptation of Mitt. Romney has run twice now, and has twice failed to demonstrate convincing campaign competence or a genuine ability to connect. And though an occasional gaffe is inevitable in a long campaign, Romney spent an astonishing amount of time munching on his own shoe leather. Further, even in the GOP’s strange 2012 callithumpian parade of candidates, he had trouble closing the deal . . . 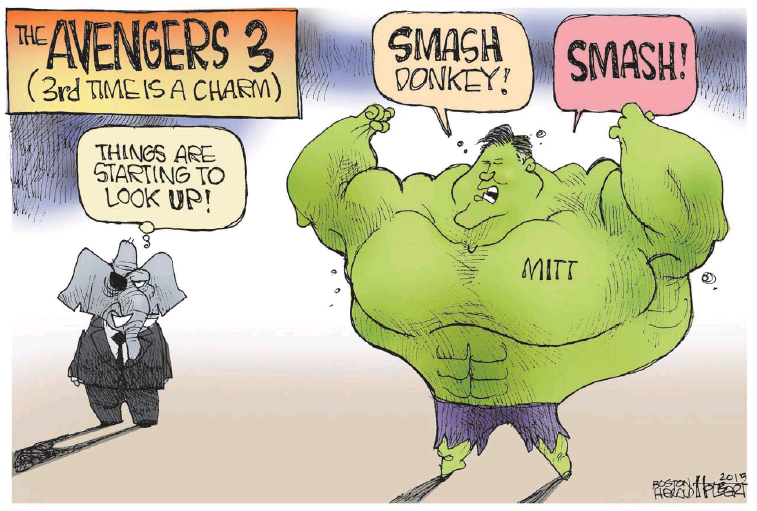 Even by political standards, Mitt’s malleability has left him looking opportunistic and inauthentic. And for good reason: He is. The Globe’s Dan Wasserman is slightly more graphic. 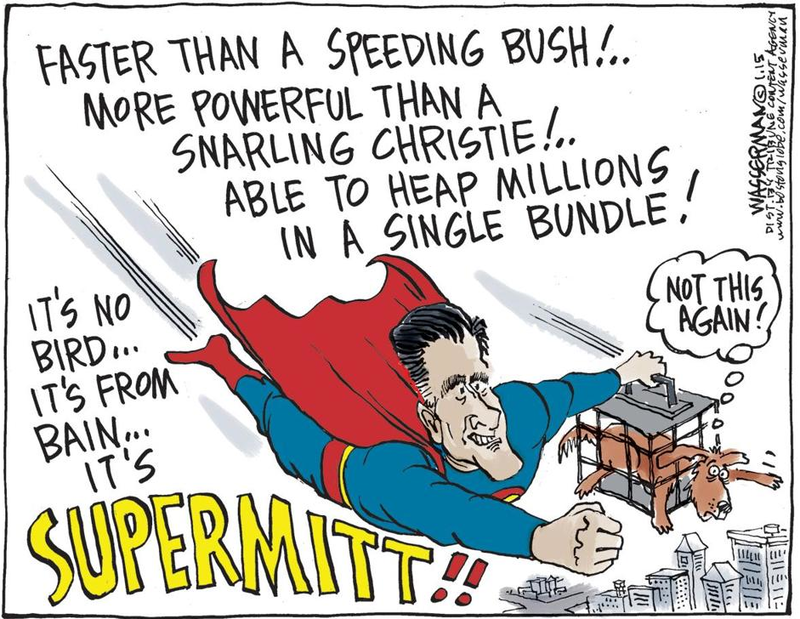 Coincidentally, the Boston Herald’s Jerry Holbert also goes the superhero route. Uh-huh. On the facing page, though, syndicated columnist Jonah Goldberg isn’t so sure. The problem is that “Romney for president” is now an art house film thinking it’s a blockbuster franchise and that there’s a huge market for another sequel. There’s not. In other words, don’t bet the Mittfecta. This entry was posted on Wednesday, January 14th, 2015 at 12:56 pm and is filed under Uncategorized. You can follow any responses to this entry through the RSS 2.0 feed. You can leave a response, or trackback from your own site.